Philips Vidiwall have been using DocMonster for 4 years and illustrate perfectly how DocMonster can provide a simple solution to document sharing and management. Philips' global reach makes dependable and secure document sharing a priority. 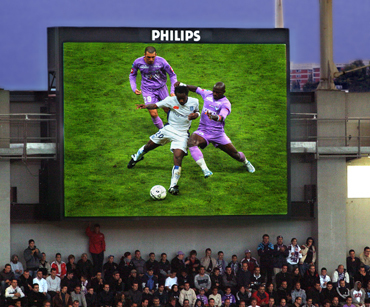 Philips Vidiwall is a leading provider of LED displays. They offer a wide range of LED video screens to the sports, leisure and retail markets. Since inventing the first video wall in 1984, Philips Vidiwall's team of engineers have installed screens in many high-profile locations around the world. Having a global sales team, it's been difficult in the past for Philips to ensure they all have up to date and accurate information. Email was relied upon, and while this was fine, there are a number of problems that come along with using email; loss of information if a users computer dies, out of date information being used because it still exists in someones inbox and the overhead of having to send the same document to many users. Philips decided to find a better solution to their document sharing requirements. Liesbeth Koole was charged with finding an answer and she looked at many possibilities before trialling DocMonster. "We looked into setting up an ftp site, but the complexity of installing, maintaining and granting the right access for the right user became a bit of a headache for non IT staff" says Liesbeth. "I saw an advert for DocMonster and decided to give the free trial a go." Philips' sales team of over 30 users now use DocMonster on a daily basis to ensure they have the up to date information they need. Liesbeth is now in no doubt of the value of DocMonster to Philips, "A huge benefit to us is that if we need to update a document, we can make the change in one central location and replace the old information. This means we know our team have the latest version. In addition, we're not clogging up anyones email with updates to documents they may not even need."